Last night, I stayed up really late playing Diablo III. The internet here is spotty at best. I played a bunch of Diablo anyway. 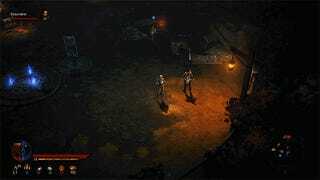 There are a lot of small differences between the new console version and the PC version—controller support, local co-op, no planned support for the planned player-vs-player arena—but the most immediately noticeable is the fact that on consoles, the game doesn't require an internet connection to play. On PC, Diablo III does require an internet connection. When the game launched, that was a huge problem, because people couldn't get their games to start. Blizzard's servers were overloaded. But as Blizzard added servers and the number of players leveled out, things quickly became more manageable, less of a catastrophe. The thing is, it's still a drag to play PC Diablo III if you don't have a great internet connection, or if you try to play while your network is running slowly or someone's downloading something. It's not about logging in and getting your session going, it's about lag in the game slowing things down and making them weird and delayed and unpleasant. There are some ways to address in-game lag on the player's end—resetting routers, that sort of thing—though there's no real solution for, say, the times when your roommate decides to stream a movie. It's such a headache, especially for a game that's pretty simple at its core. Diablo III should be about blowing up little monsters, not clearing the cache on my router and leaving massive info-dumps about my ISP on Blizzard's forums. I've been surprised at how enduring Diablo III has been for me, but in three of the last four places I've most recently lived, I've had inconsistent enough Internet that it's put me off playing. Sometimes it's fine, but then lag will hit. I'll input a command and the game will hang, or my character will weirdly levitate around the level, or there'll be a big gap between when I activate a power and when I see it fire off on screen. Notice the gap between when her firing animation begins and when the arrows actually begin to fly. Everything's like that—enemies on the battlefield, her fast-moving dodge, special attacks. Like I said, my current internet speed isn't amazing. It ebbs and flows, and sometimes the game plays fine. But if someone else on the network starts browsing the web or streaming a video, forget it. Press the button, get an instant response. When I disconnected the console from the Internet, it made no difference, because the console version doesn't require an internet connection. Diablo III requires a constant internet connection to play. Not just to start a game or activate a new copy, but to play. Always. An hour and a half after I had started trying to log in from the title screen, I gave up. I couldn't play Diablo III, even the single-player portions of the game, because Blizzard's servers weren't working. I did acknowledge that there were some things about the game being online that weren't all bad - in some ways, the idea of playing in an interconnected world made it more appealing to me. But as time passed, I settled into a rhythm: I mostly play single-player. I play for fun, and don't really care about chatting with or playing alongside Internet strangers. I might as well be offline. The Ultimate Evil Edition pretty clearly underlines the fact that the PC version never really "needed" to be always online. It's easy to imagine the alternate reality where this game was the one Blizzard launched on PC back in 2012, minus the expansion and a few of the other tweaks they've made since then. It could have had some sort of offline singleplayer mode, a LAN mode, other things of that sort. That's what the new console version offers, and it's been terrific fun, to the point where I'll probably stop playing on PC entirely. That'll partly be because I like kicking back and playing with a controller, but it'll largely be because I'll never have to worry about unexpected lag slowing down my singleplayer game. Only the decision-makers at Blizzard know the full rationale for saddling the PC version of Diablo III with an internet requirement. Maybe it was to fight piracy, or exert complete control over the game and its balance, or to cut off hackers and cheaters, or maybe it was because they were invested in the (now failed) idea of the Real Money Auction House. Probably some combination of all those. 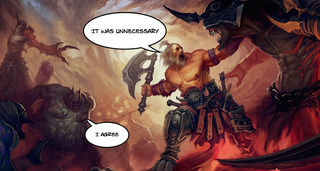 Regardless, two years after it came out, it's clearer than ever: Diablo III never should have had an internet requirement in the first place.